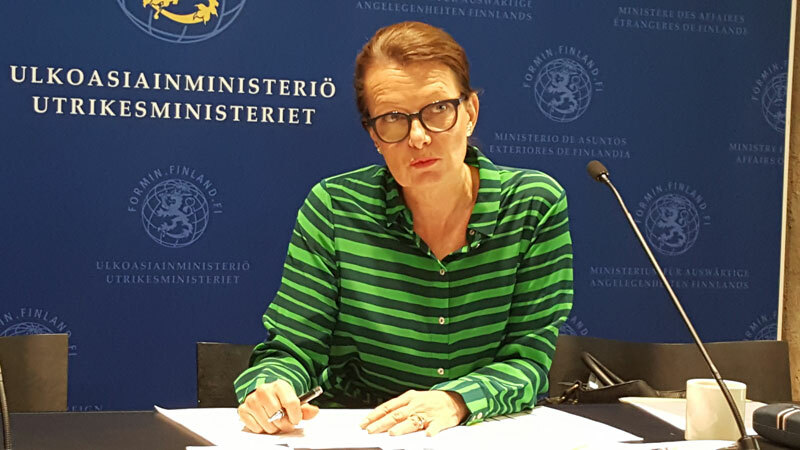 Finland is prioritising Education, Health, and Gender as part of its development plan for Myanmar. Mizzima’s Editor-in-Chief Soe Myint was in Helsinki at the invitation of Finland’s Ministry of Foreign Affairs for World Press Freedom Day on 3 May. Here he was able to conduct an exclusive interview with Ms. Lenita Toivakka, Minister for Foreign Trade and Development. You mentioned about education, health and gender and women’s empowerment as key priorities for development. When it comes to Myanmar how about support to the media specifically because we have an emerging media process in the country. Do you have any programs now? I think we don’t have that kind of program now for supporting free media in Myanmar. We have different kinds of programs and I know that our support is going to increase and will be higher than it has been recent years so Finnish support to Myanmar is increasing in different sectors. And the main sectors we are really going to focus on includes empowering women developing cooperation with a partner country. Then there is education, quality education, how to manage your resources better, then there is support for your democratic development. At the moment it is government to government cooperation are you also going to work with other stakeholders? It is government to government but at the same time it also with international organisations like the UN but also Finnish NGOs. Our education program is with a very valuable Finnish organisation. But we are also going to have cooperation with the UNDP. Your government is supporting the peace process in Myanmar what is your view in relation to the ongoing peace process? We want to support the good developments [taking place] at the moment. To give support to the new government and also to help you to respect the rule of law. It is very import for Finland to respect the rule of law and democracy and I think these are the issues we want to do with your country. Also to strengthen all kinds of democratic institutions you have now because we know it not so easy to just start that kind of work you may also need some support, expertise, and know-how. We have a big issue in relation to capacity building even in the media sector or development sector there it is a major issue so what could countries like Finland do to offer support in the process? We are actually doing this with other good organisations, these organisations have a great deal of experience in different countries. They have very good tools to strengthen your education system of course they work together with you, it is not something we are going to export from Finland because that doesn’t work. We have to do that with your people and your government together, I think that is the Finnish way to do this kind of cooperation. In your view what is the interest of Finnish companies coming to Myanmar, and what kind of sector would they be looking into? There is interest. I have a plan to come this year with a business delegation. Of course, first I would like to visit some the development cooperation projects but then I am going to come to your country with a business delegation and I think the sectors are clean technology, education sector, also maybe renewable energies, bio-economics because you have huge resources in your country. I think those sectors are very interesting when we think about your country. But also at the same time, this good cooperation on development is a very good foundation to start trade cooperation also. I think we have many Finnish companies who can help build your country.